I received an email from iHerb today announcing that the weight limit for Singpost has increased from 10 pounds to 14 pounds (6.35 kg) for a flat rate of $4! That means you can ship more items from the US to Singapore for the same price as previously! And for order of $60 or more, and you will receive a minimum 5% discount once you are about to finalize your order. 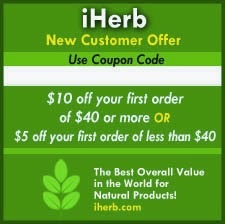 If you're first time customers, you can use my affiliate code RKF401 to get $5 off $20 purchase or $10 off $40 purchase. A great way to stock up on essentials like cold-pressed, extra virgin coconut oil, Real (Sea) Salt, and essential oils.